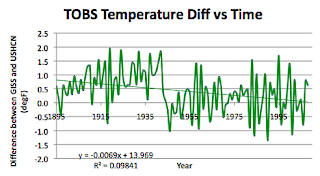 I have reached Ohio, in checking on how the temperatures of the states have varied over the last hundred or more years. 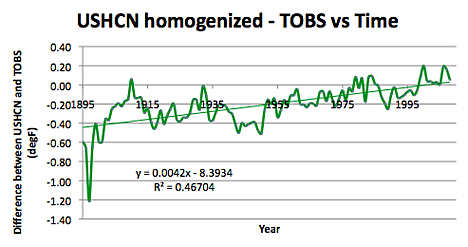 Given that this is the first state where I haven’t previously looked at the homogenized data before looking at the TOBS values, I thought to include both sets into the table that I have been building. Which I did, and there are some 26 stations in the US Historic Climatology Network (USHCN) so that I downloaded these into the table first. Then I went to get the data from the GISS stations that I am comparing the USHCN to. It turns out that, according to Chiefio there are 5 GISS stations that they continue to draw information from. These are in Columbus, Dayton, Akron, Youngstown and Toledo. 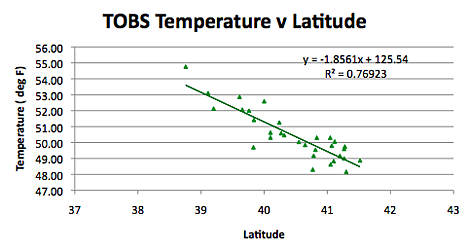 Columbus is fine, a full set of data, as is Toledo (though a little difficult to find within the GISS structure). However, when I tried for the other three, there were a couple of surprises. It turns out that there are three different stations that have been taking readings at Dayton. However there is only one still doing so, and it had the longest history (albeit only back to 1948), so I used it. 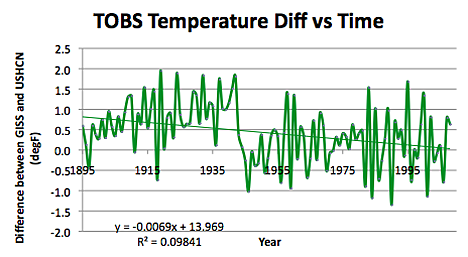 The other stations only have been recording data since 1944. Again it is surprising that other stations weren’t chosen that had a full record. 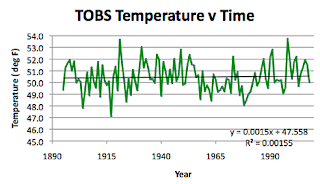 While the temperature trend with time is positive, the raw data gives an increase of only a 0.15 deg per hundred years, while the homogenized data would suggest that the increase is a 0.57 deg temperature rise over the same interval. 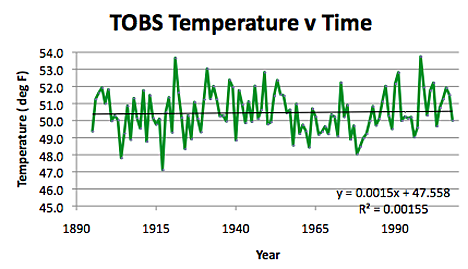 And in regard to the highest temperature that still seems to have occurred back in 1921. In Ohio the relationship of temperature with latitude remains linear, and is shown in both homogenized and TOBS data, though the TOBS data gives the better correlation coefficient, otherwise 0.61, (which may be as a result of the homogenization process). 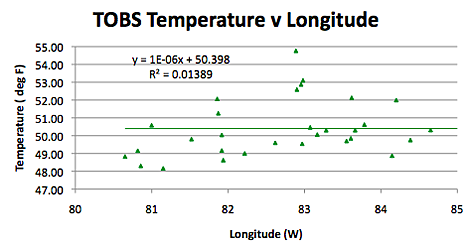 Looking at longitude, there is not much of a trend, as there hasn’t been elsewhere. Although in this case homogenizing the data improves the correlation (to 0.06). 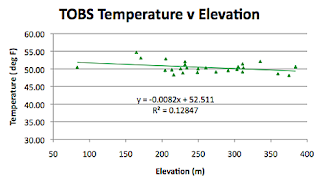 Homogenizing the data improves the correlation with elevation (but to only 0.22) and the rate of decline (to 0.013) relative to the TOBS data. In Ohio there was only one place, Millport, where I could not get population data, and this appears to be because it is now considered to be a part of Ashville. Other than that the logarithmic relationship that seemed quite strong in the West, is not doing that well in the East. And since I now have them on the same page, let me close with a plot of the difference over time between the homogenized data and the TOBS values for the state. 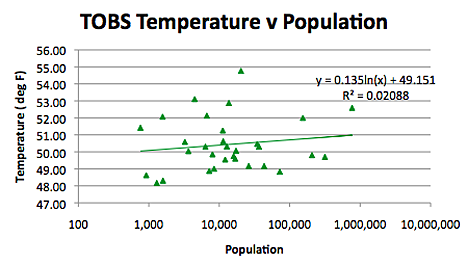 And this indicates something that I have had a suspicion about as I have been posting this data. 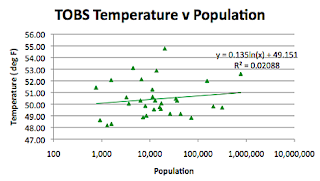 Perhaps it means that that I should go back and make this plot for the other states I have tabulated. (groan). Does the fossil fuel industry need innovation? Deepwater Oil Spill - changeover completed.